Glenn Switkes of International Rivers for reviewing the text prior to publication. The Xingu-Tapajos watershed is the place where the Culuene and five other southern rivers join to form the Xingu, and is considered the place of the world’s creation by the indigenous peoples of the Upper Xingu. 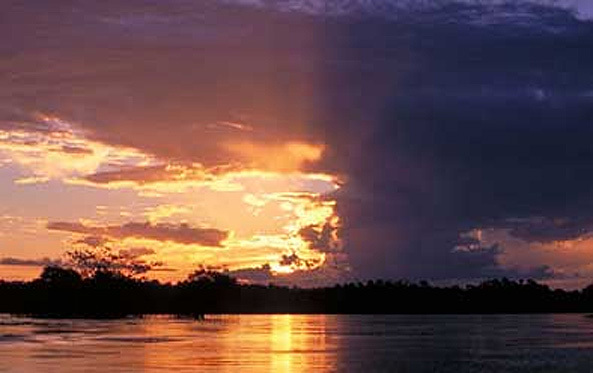 At the Xingu headwaters, there is a massive lake, a network of eaons (natural canals), and wooded islands. The river then descends northward to the Amazon with approximately 500 miles of rapids. The terrain shifts from tropical savanna in the south to the Amazon rainforest in the north. The native inhabitants of the Upper Xingu region include the Aweti, Kalapalo, Kamaiurá, Kuikuro, Matipu, Mehinako, Nahukuá, Trumai, Wauja and Yawalapiti. These communities speak their own languages but are interconnected through trade networks, marriages and intervillage rituals. Their natural landscape is filled with physical remnants and symbols of past events that shaped the people’s history. Contemporary rituals reenact these events. For example, humans are thought to have been created from wooden logs of the kuarup tree that were placed in a secluded chamber made of straw; thus, adolescents going through puberty and parents with newborns stay in seclusion to honor these times when personhood formed. The kuarup remains an important wood in ceremonies, including a lengthy funeral ritual that is so well known that the tribes are now sometimes referred to as “Kuarup” by people throughout the Upper Xingu region. Spirits are thought to inhabit the wild lands outside villages, generally only entering a village at times of sickness or when they are called by a shaman. The tribes are village-centered, with a central plaza that serves as a political and religious gathering place. Primary subsistence is fish and bread and porridge made from the cultivation of manioc, though the people farther north supplement these with red meat and other agriculture. In the late 1800s, anthropologists and explorers began documenting the numerous tribes of the region. Slowly, Europeans started to trade and settle there, bringing infectious diseases that killed many Indians, completely wiping out several tribes. A government campaign in the 1940s to promote settlement in the western provinces — with the goal of exploiting the Amazon Basin’s vast natural resources — increased the spread of infectious diseases and also exposed tribal peoples to abuse and even murder by goldpanners and ranchers. In 1884, the estimated population of the upper Xingu River was 3,000; by 1965, a study reported only 542 remaining. Some concerned Brazilians, including the now famous Villas-Boas brothers, decided to demarcate the lands of the local tribes with the hope of protecting “Indians of pure culture” from the influences and impacts of the new settlers. They faced heavy opposition from ranchers and the federal government at the time, yet succeeded in recreating a significant portion of the original Indian territories as reserves. This territory became the Indigenous Park of the Xingu in 1961. Meanwhile, the government continued a policy that regarded other tribes adjacent to the Xingu area—the Ikpeng, Kaiabi, Suyá and Yudja—as barriers to the process of colonization and road-building in the area. These groups, which have distinct cultures from those native to the Xingu watershed, were forcibly relocated to the newly created park. Under the paternalistic yet arguably compassionate administration of Orlando Villas-Boas, the park was essentially isolated from Brazilian society and development, allowing the environment and its peoples a measure of protection that the rest of the Amazon Basin was not afforded in the 20th century. The Indigenous Park of the Xingu, the first Indian territory officially recognized by the Brazilian government, today sits between the Curisevo and Culuene rivers in the modern Brazilian state of Mato Grosso. Fourteen tribal groups, now with a population of approximately 4,000, continue to live in the park, with an additional 21,000 indigenous people living along the whole river system. While many languages have gone extinct, several endangered languages continue to be spoken within the park. A few of the communities whose traditional lands were adjacent to the park regained their original lands in the 1980s when some reforms to the Indian reserve system were implemented, but most tribes are confined to the limited boundaries of the park. Xingu Park is an oasis in the still remote north-central Brazil that is being invaded by massive dam projects, logging, soy and corn farming, and cattle ranching. Much of the primary forest and vegetation of the Xingu headwaters, including the Culuene tributary, has already been devastated. While the park itself is now protected, many threats to the ecosystem come from the areas surrounding the park. The scrubby grasslands of the savanna now only remain within the Indian reserves, and increased population has polluted the headwaters of the tributary rivers. In the 1980s, recreational and commercial hunters and fisherman entered the area, followed by loggers and large commercial farming enterprises, which now dominate the local economy. Today, the entire Xingu River system is slated for massive hydroelectric dam development. Though dams have been discussed since the 1980s, environmental review and community resistance have stalled their implementation, including a protest by the Kayapó in 1989 that prevented the state electric company Eletronorte from constructing a six-dam complex on the Xingu and its tributary, the Iriri River. The company then turned its attention to the Belo Monte dam on the main stem of the Xingu, which would be Brazil’s largest hydroelectric complex and the world’s third largest. Belo Monte would flood about 400 square miles of land and displace an estimated 20-40,000 people, drying up the river around its “Big Bend,” home to 450 indigenous people. In 2005, after Senate approval of the project, a lawsuit was filed by federal attorneys claiming that the project should not be approved because indigenous communities were not consulted, as required by Brazil’s constitution. If the project is completed, it will divert around 80 percent of the Xingu River’s flow. Although the lawsuit, along with widespread national and international protest, hindered the project’s progress, in February 2010, the Brazilian environmental agency issued a preliminary environmental license for the dam’s construction. Federal attorneys have filed suit to force the government to hold additional public hearings to discuss the project’s impacts, and further legal challenges to the project are likely. Independent investigations have reportedly found that project studies underestimate the potential impacts of Belo Monte. In spite of the uncertain legal status, construction of Belo Monte Dam started in 2011. On the Culuene River, the Paranatinga II dam is one of several “small” dams fast-tracked by the government as an alternative energy source. Several tribes opposed to the dam took the government to court in 2005; the project was suspended for a year but ultimately approved, despite the fact that the Institute of National History and Art and the National Foundation of the Indian identified several sacred sites associated with the mythology of the Upper Xingu peoples that were vulnerable to inundation once the dam was built. (For other sacred places threatened by dam flooding, see our reports on Rainbow Bridge in Utah and the McCloud River in California.) Now that the Paranatinga II is up, local Indians say the dam threatens stocks of the migratory fish that are the basis of rituals of the Upper Xingu tribes. Much larger in size, Belo Monte’s design includes fish “stairs,” meant to help migrating fish make their journey upriver. Tribes and the university-based Institute for Advanced Amazonian Studies question whether the fish stairs will permit adequate numbers of spawning fish through the dam. Due to low water levels three months of the year, Belo Monte would have to cease operations and water would be stored in another proposed dam — the upstream Babaquara Dam — which as originally designed would flood 6,000 square miles of rainforest. Although construction has been halted on the project multiple times due to occupations of the site and legal appeals, the $14 billion Belo Monte Dam is now more than 50 percent complete and may be finished as early as 2015. The greater Xingu River area is also being rapidly deforested for commercial timber and to create more farm acreage to meet the demand for corn and soy products — a demand recently spurred by the growing movement for biofuels. Due to poor official leadership and a paltry budget for the administration of Xingu Park, there has been rampant illegal logging in the park. The tribes have demanded that the local government be held accountable for its failure to stop the logging and have resorted to violent confrontations with the logging companies in the absence of government enforcement of laws. The limited territory available to park inhabitants, the increasing need for resources to produce products demanded by the outside world, and skepticism on the part of local people about economic development schemes are all factors to be considered in the planning of sustainable development. In recent years, the Xingu tribes have united to form several associations to protect their common interests. These associations must walk a careful line between working with Brazilian government and the external policy world, while reconciling their methods with the traditional leadership system within each village. To begin to confront the effects on park land from land use outside the park, the Xingu Indigenous Land Association and the Socio-environmental Institute have established the Borders Project, which attempts to map encroaching deforestation and identify new vectors of activity heading towards the park. It also trains the staff of the posts and maintains the physical boundary markers of the park. Another sign of progress occurred in late 2006, when the Federal Minister of Justice recognized 10 new indigenous reserves, a decision that returned control of more than a million hectares of territory to tribal landholders. There have been several successful lawsuits by tribes petitioning to have their traditional lands included in the park boundaries. Merely designating borders, however, does not put a stop to the forbidden activities; enforcement of the laws is a continual concern. To this end, a network of 11 vigilance posts has been established to control entry into the park. The Brazilian Environmental Justice Network has launched an international campaign demanding that President Luiz Inacio Lula da Silva and other Brazilian authorities stop the Belo Monte dam project. The online magazine Intercontinental Cry has details in English on what you can do. You can also submit an online form to the Brazilian government, as well as get additional information, from our friends at International Rivers, longtime opponents of the Belo Monte dam. To learn more check out “Rain Forest Warriors: How Indigenous Tribes Protect the Amazon,” by Barbara Zimmerman on the Amazon Watch website; and the International Conservation Fund of Canada’s program: Securing protection of Kayapó Indigenous Territories in the Brazilian Amazon. Friends of the Earth-Brazil. Amazonia. International Rivers. “World’s Third Largest Dam Project Would Devastate Vast Area of Amazon Rainforest.” News release, February 10, 2010.
International Rivers. “The Sacred and the Profane.“International Rivers, March 2, 2008.
International Rivers Network. “Xingu River.” International Rivers. International Rivers Network. “Brazilian Dams.”International Rivers. MAB. Movement of Dam Affected People-Brazil. Osava, Mario. “Brazil: Small Hydroelectric Dams Not So Green.” Inter Press Service, August 9, 2008.